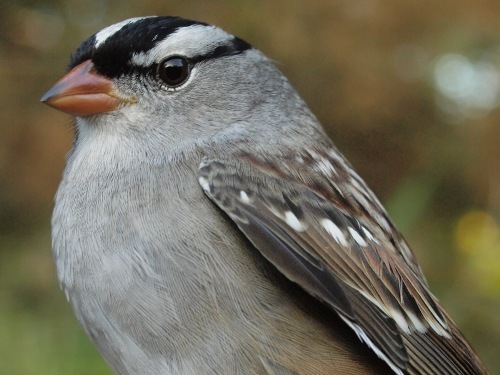 this week it was sparrows that dominated, including five of the top ten species banded. One of those was five was White-crowned Sparrow. Notes: Although the weather remained a bit unsettled this week, it was an improvement over week 10. It was also incredibly warm for this time of year, with daily maximum temperatures as high as 25 Celsius, almost unheard of in mid-October. Despite that, migration was strong, with the 408 birds banded this week well above average, and the highest for week 11 since 2010. The lingering warm weather may have been reflected more in the count of species observed this week – 75 set a new record for this period, far ahead of the 68 counted in week 11 of 2005. The season total to date of 143 is tied with last year for the highest count to this point in the season. 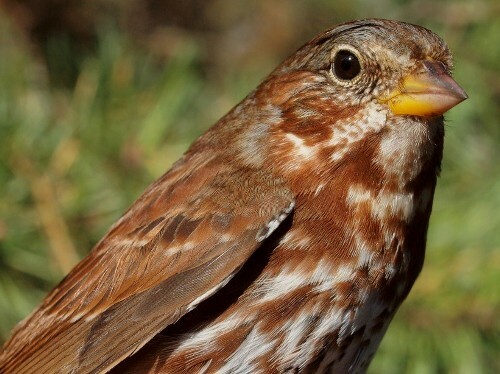 Fox Sparrows are always a sign that we are approaching the end of fall migration. It was a good week at MBO for uncommon species, with Ruffed Grouse, Northern Mockingbird, and Eastern Towhee all observed for the first time in 2014. It was only our eleventh Ruffed Grouse sighting in MBO’s ten-year-history (and the first since March 2011), our fifth Northern Mockingbird (others 2005, 2007, and 2012), and our sixth Eastern Towhee (and first since May 2011). An additional four species were new for this fall – American Black Duck, American Woodcock, Great Black-backed Gull, and American Tree Sparrow. However, no species were banded this week that were new for the season. We were surprised this week to see White-throated Sparrow rebound to the top of the list of species banded, and with the highest weekly total of the fall at that. Over the years, the peak for the species has tended to alternate between weeks 9 and 10, almost always with a sharp drop-off in week 11. The lingering warm weather this fall may be facilitating the sparrows staying around longer than usual, although this may also reflect a trend of later migration, in that this is the third year in a row that a new record count has been established in week 11. In 2007, 2012, and 2013, Ruby-crowned Kinglet was banded most often in week 11, and this year it was in second place. After a relatively slow migration so far this fall, there was a dramatic influx of Hermit Thrush this week – nearly as many as in the record week in 2010. Slate-colored Junco and Yellow-rumped Warbler numbers remained relatively steady from last week, and were fairly typical for week 11. A new wave of Swamp Sparrows appeared to come through this week, while Fox Sparrows have started to arrive in decent numbers. Notably absent from the list is American Robin, which was in the top two from 2005 through 2009, but has been less prominent in week 11 over the past five years, perhaps also suggesting migration is shifting somewhat later. The species observed this week were very similar to last week, with six species remaining in the same ranking in the top ten, and three others in the middle just shuffling amongst themselves. Canada Goose was the most abundant species again this week, as it was for week 11 in 2005, 2007, 2011, and 2013. Red-winged Blackbird was the runner-up, as in three of the previous four years, although in somewhat lower numbers than usual. White-throated Sparrow remained in third place, with a mean daily count 50% higher than the previous week 11 high of 63 set back in 2009. Meanwhile, although American Robin rose to fourth place this week, it was the lowest ever mean daily count for week 11. Overall, the top ten species observed were very similar to last week, reflecting the unseasonally warm weather that lingered through much of the period. Although our focus is on Northern Saw-whet Owls, we are always happy to have the opportunity to band other species. This Eastern Screech-Owl was our first of this fall, and just our tenth individual over the years. 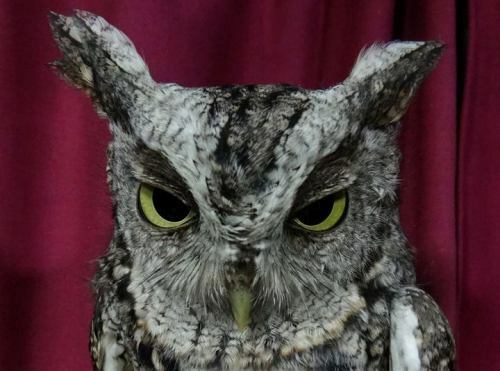 After the slowdown in owl migration last week, we were happy to see this week start off with 15 owls on the night of October 10, and another 14 the following night, plus a recapture of an owl that was banded in Pennsylvania. After that, numbers tapered off again, with 7 on October 12, and 2 on each of October 13 and 14, before rain moved in again, cancelling the final two nights of the week. 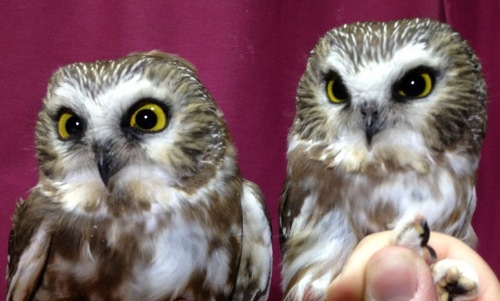 Two of the Northern Saw-whet Owls banded this week. 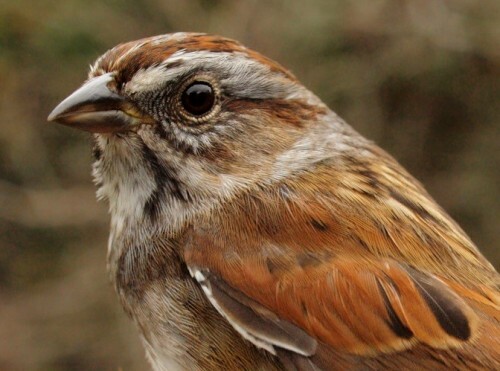 Swamp Sparrow is usually the fourth or fifth most abundant sparrow at MBO over the course of a fall season, but tends to go relatively unnoticed because their movement is relatively slow and steady throughout our monitoring period. This week there was a notable spike in numbers, with 12 individuals banded.